A technical incident involving an Aer Arann plane, which had landed safely, will see Shannon shut until 4pm. The Aer Arann aircraft, carrying Aer Lingus branding, lies just off the runway after the incident at Shannon Airport this afternoon. SHANNON AIRPORT HAS been closed this lunchtime following a technical incident at the airport. 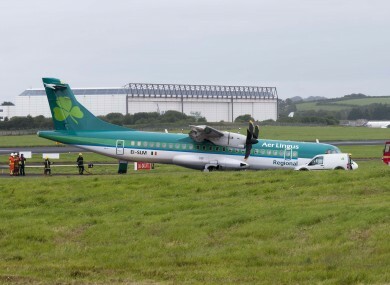 An Aer Arann ATR-72 plane, operating Aer Lingus Regional flight EI1601 from Manchester, developed a technical problem after landing with its crew of four and 21 passengers at 10:21am this morning. The plane landed safely amid turbulent conditions, but it is understood that the aircraft’s nose wheel collapsed as the plane taxied off the runway. The plane safely stopped within a protected area, and all passengers and crew safely disembarked the plane. There are no injures reported. The airport will remain closed until at least 4pm this afternoon while an Air Accident Unit investigates the incident. All inbound flights are being redirected to Cork and Dublin airports. A number of outgoing flights to the United States have been delayed at Shannon. Passengers are advised to contact their airline to seek further information on how their planned services may be disrupted. Email “Shannon Airport closed following technical failure on Aer Arann plane”. Feedback on “Shannon Airport closed following technical failure on Aer Arann plane”.